Tucked away in Siberia, there are furry, four-legged creatures with wagging tails and floppy ears that are as docile and friendly as any lapdog. But, despite appearances, these are not dogs—they are foxes. They are the result of the most astonishing experiment in breeding ever undertaken—imagine speeding up thousands of years of evolution into a few decades. In 1959, biologists Dmitri Belyaev and Lyudmila Trut set out to do just that, by starting with a few dozen silver foxes from fox farms in the USSR and attempting to recreate the evolution of wolves into dogs in real time in order to witness the process of domestication. This is the extraordinary, untold story of this remarkable undertaking. Most accounts of the natural evolution of wolves place it over a span of about 15,000 years, but within a decade, Belyaev and Trut’s fox breeding experiments had resulted in puppy-like foxes with floppy ears, piebald spots, and curly tails. Along with these physical changes came genetic and behavioral changes, as well. The foxes were bred using selection criteria for tameness, and with each generation, they became increasingly interested in human companionship. Trut has been there the whole time, and has been the lead scientist on this work since Belyaev’s death in 1985, and with Lee Dugatkin, biologist and science writer, she tells the story of the adventure, science, politics, and love behind it all. In How to Tame a Fox, Dugatkin and Trut take us inside this path-breaking experiment in the midst of the brutal winters of Siberia to reveal how scientific history is made and continues to be made today. To date, fifty-six generations of foxes have been domesticated, and we continue to learn significant lessons from them about the genetic and behavioral evolution of domesticated animals. How to Tame a Fox offers an incredible tale of scientists at work, while also celebrating the deep attachments that have brought humans and animals together throughout time. Prologue: Why Can’t a Fox Be More like a Dog? "A story that is part science, part Russian fairy tale, and part spy thriller. . . . Sparkling." :Dugatkin is a veteran science writer with a knack for turning sprawling subjects into compact, enjoyable narratives. Ms. Trut, now in her 80s, is both a co-author and a subject of the book, an unusual arrangement. But her intense participation adds a rare degree of intimacy to this science story." "A cheerful, easy-to-read account that expounds upon the wonders of scientific achievement. . . . The authors weave other charming histories of other scientific studies and events throughout the book, including the discovery of hormones, pedigree analysis, animal communication, human evolution, and Belyaev's travels in international scientific circles. Writing a simple, straightforward narrative suitable for lay readers, Dugatkin and Trut spin complex genetic science into a fascinating story about adorable foxes." "Profound insights into how dogs evolved from wolves come from a remarkable, multidecade experiment on foxes that was carried out under the supervision of the Russian geneticist Dmitri Belyaev from the 1950s onward. Because much of the research was published in Russian, How to Tame a Fox, which is cowritten by Lyudmila Trut--a central figure in the project over many decades--will be widely welcomed for the extraordinary detail it contains." "If you read only two biology books this year, this is one of those two that you simply must read." "It’s a story of science. . . .But it's also very much a human story. . . . It's a story of persistence against all odds." 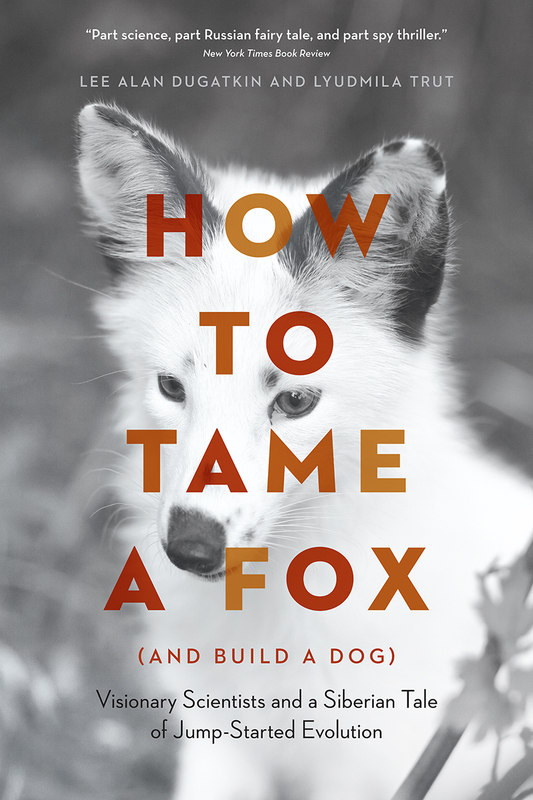 "Trut and Dugatkin lovingly recount some of the experiment's milestones, including the first fox born with a wagging tail and the first one with droopy ears. . . . At every step, the authors skillfully weave the science of domestication into the narrative of foxes becoming ever-more doglike." "It is an extraordinary story, and How to Tame a Fox tells it well. . . . By the end of the book, the thesis that wolves may have been no less complicit in the process of their domestication than humans has come to seem entirely probable." "Written for a general audience, it chronicles the story of a scientific gambit that was more successful that even its creators had dreamed. It's an inspiring reminder of how much we still don't know about the world, and how much can be learned by taking bold chances. It's also a cautionary tale about the risks of state-funded science that has nearly as much relevance to Trump's United States, where federal research budgets are in danger of being slashed right and left, as it does to Stalin’s Russia." "Written in an accessible style, How to Tame a Fox provides a general reader with an engaging summary of the fox experiments and the people who carried them out. . . . It would make a good book to assign to undergraduate studying the social dimensions of science." "Celebrates his [Belyaev’s] original insights, his tenacity, and the amazing leadership and hard work by Trut and her dedicated team. . . . Written in a highly accessible style, it is appropriate for both scientists and nonscientists." and political milieu in which we practice our craft. precision with which the science is described." "Intelligent, accessible, and engaging. It’s a story of courage as well as genius, and a reminder of the enormous value of a scientific curiosity."